Swedish winger Freddie Ljungberg has set his sights on the Scottish league as he is poised to join Glasgow Celtic this week. The 33 year old former Arsenal and Chicago Fire winger hopes to make his debut against old firm rivals Rangers "They have said some amazing things about the fixture so of course I would like to play in it. I'm available to play for any club on 1st January so we'll see what happens." 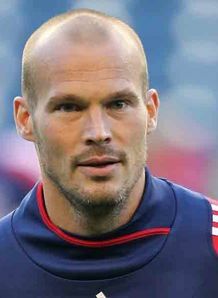 Ljungberg has somewhat fallen off the map since leaving football giants Arsenal a few years ago, enduring torrid times with injuries during a spell at West Ham before moving to Chicago but claims, "I'm as fit as I've been for a long time since I had surgery on my hip two years ago." The deal looks to be all but finalized as Celtic manager, Neil Lennon, shares Ljungberg's beliefs about his health, "I don't think he is over the hill. I think he is 33 but he has always kept himself in good condition...It is the quality he can bring to the club and if it is there we will pursue it." Celtic are in need of reinforcements to the squad as pivotal Asian pair Cha Du-Ri and Ki Sung-Yong are set to leave for the Asian Cup before the start of January. Cha has already echoed his manager's sentiments about the quality Ljungberg possesses "He's a good player and if he comes to us then I think he can help us. It's great for us."